New favorite advertising campaign...and I don't even own a Sienna. FINALLY! I have had the chance to clean the kitchen and snap a couple of pictures before the next mess was made. I had about 2 minutes. No lie. So here it is. I love it. The layout is the exact same. We re-installed our old countertops and used the old appliances so it's not really new looking. BUT there are some different cabinets and we have the nice big extra pantry cabinet (see next photo) so it really holds a lot of stuff now. Horray! I won't say it was worth ALL the stress and time and inconvenience, but it is definitely worth most of it! The good Meile boys were in there late on December 23 because they said they'd have me in by Christmas. What great guys! Thanks! This pantry is as deep as the fridge and holds a TON of stuff. We used to have just a counter all along that wall, but it was just a mess zone. There's shelves inside and I just keep stocking it and pushing things back. I thought it had no back on it and was nothing but magic. Unfortunately, I bumped up against the back of the cabinet when I was trying to find a place to store my red vines and chocolate-covered pretzels. Curses! No worries. I found another hidey-hole in the super deep cabinets above the fridge! Isn't it so pretty?! We love the new slate tiles and they aren't as cold as I thought they'd be. I'm glad we went with laminate in the rest of the house again, however. We installed a natural cherry wood laminate to sorta tie into the cabinets. It's purty. Someday we'll do a great glass tile backsplash in oranges, yellows and reds, but do you know how much GLASS TILES cost?! Sheesh! I totally went into the wrong line of work. Glass tiles is where the money is.... We want to replace the old track lighting as well, but again time and money stand in our way. Plus, the fact we want to be DONE with home improvement for a while. Uh-huh. Especially since 10 out the 12 months in 2009 involved havoc caused by home improvement. Our next project is tentatively scheduled for 2017. We'll post pictures. #9 I've learned some mad camping cookin' skillz due to a lack of conveniences. #8 I've whittled down my necessary utensils to two spatulas, a set of knives, a whisk, three spoons, a manual can opener and an ice cream scoop. Who knew you didn't need all those gadgets? My new drawers will be so tidy. #7 I know what restaurants have the most "not necessarily healthy, but not as horrible as fast food" food choices. And although I won't want to eat out for a while, this is knowledge that I can carry with me. #6 My big utility sink holds more dirty dishes then my regular sink. #5 I have become one with my microwave. #4 It doesn't really matter how much money you put out for plastic utensils because they all break anyway. #2 I was able to truly clean all that gunk that had dripped down the sides of my stove from the counter. Oh My Heavens....I will not tell you how gross that was. #1 You can't mop the concrete floor. After a few months of trying and a week of wet underpants, my last baby, Zach, is finally potty trained! Let's all take a moment to realize that my sweet babies are all growing up. Okay, that's enough of that! Now let's think of the extra money, time and sensory calmness I will now be able to enjoy! HOORAY!!!!! I've been changing diapers continuously since January of 1998 and now I'm free! Cute; Naughty; Cute; Naughty. Repeat all day long at 5 minute intervals. laughing hysterically. I, not being a 3-yr-old boy, didn't get any of them. 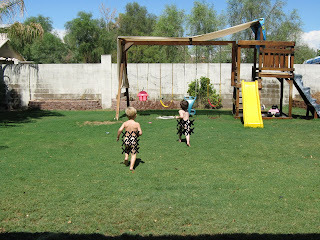 Zach and Boogie (Haydn) decided the day was too beautiful for clothes. It seems most days are too beautiful for clothes. Sigh. The boys were watching the "worker guys" push wheelbarrows filled with wet cement from the front of the house to the backyard. GREAT FUN! Especially when they try to recreate the experience with mud. With no coaching from me and having never seen "Wierd Science," the boys found new ways to have fun. This is before all the cushions were removed from the couches and plywood from said couches used as springboards into the pool of cushions. It's a good thing that those two boys are SO STINKIN' CUTE! My Super 40 Birthday Bash! 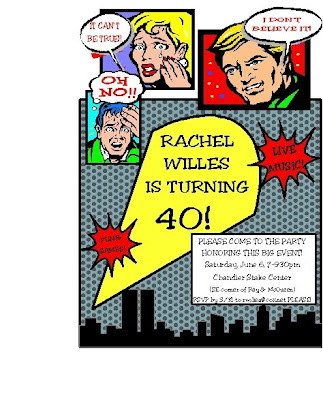 THE BIG 40th BIRTHDAY BASH! So, I turned 40 this month, June 12 to be exact, and earlier this year I said to myself, "Self, I think you deserve a big ol' birthday party!" Well, myself and I agreed with me and the three of us started planning. The biggest problem was, however, finding the time to plan this shindig. See...I had my proverbial plate proverbially full and I had to squeeze the planning in and around the multiple other projects (ie kids' b-day parties, stake primary events, girls camp song skit planning, kindergarten memory book production, vacations) I was involved in on top of my full-time jobs of wife, mother, babysitter and part-time accountant. Yes, I looked at my schedule and thought for just a brief...brief moment that I was overextending myself. But then I said to myself, "But Self, you are now overextending yourself for YOURSELF." Once again, my committee of me, myself and I was unanimous in its decision and the party got planned....and planned well, I might add. I created this lovely invite on my laptop and thought it was fun. I didn't know why I chose the Super Hero theme. I certainly don't think of myself as a Superhero as I have absolutely NO superpowers and I completely lack a nemesis (unless you call TIME a nemesis.) I just really liked the look of it all and decided to carry the theme into my party. The two main things I wanted were a live band and to arrive at my party in a hearse. I got both. Yeah...baby. So, take a look at my pictures and enjoy. I pretty much invited everyone I've ever known over the past 25 years so you all should have gotten an invite. If you didn't get one I'm sorry. Let me know and I'll get you one for my 50th Birthday Party. It you got one and couldn't come...we missed you but partied hard anyway! To those that came...THANK YOU - MASSIVE AMOUNTS OF THANKS! It was great to see you all and some came from far off so again thanks. I have been blessed with awesome friends and family. Yes, indeedy. Here I am arriving at the party. I found this guy online. He makes a living restoring cars, but makes a "killing" renting out his hearse filled with caskets that have been converted into coolers and kegs. No...I didn't get a casket. He picked Troy and I up about 645p and we drove around for about 30 minutes til most of the party goers were there. Then Nate, my bro, flashed the SuperSignal for me (& called me on the phone), had the guests go outside and I arrived. Way too much fun. I could hear the cheering as we turned into the parking lot. My SuperStar moment. In case you're wondering, my shirt says "c.1969" (with the "c" in a circle.) Check out photos below for better detail. Here's my Super Signal. I had found a 8ft by 23ft "scene setter" for a cartoon Batman party. It just had the cityscape in it. It fit the walls perfect and we took it all the way around. The band played at the end of the party. We mingled, ate, sang Happy Birthday, and most did the stations around the room: "Pick Your Super Hero Name;" "Pick Your Super Power;" and "Super Hero Photos." Again...don't have any reason for the Super Hero theme except...I liked it. Me schmoozing...it's what I do. It was great to see everyone, I'm tellin' you! 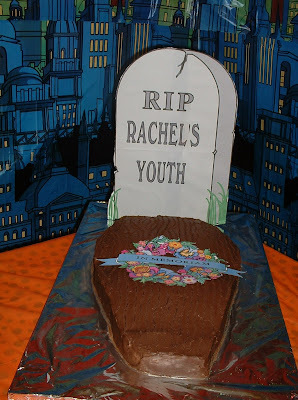 In accordance with the hearse we wished a warm "Rest in Peace" to my youth. It was a sad thing to have to do, but I'm over it. Bring on middle age, baby. 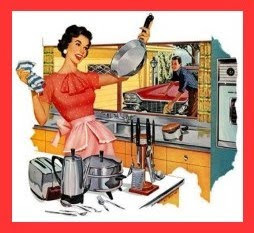 I can now do all sorts of things I couldn't do before and just blame my age- like forgetting things...repeatedly; wearing lots of elastic; and using my ailing and aching body parts as an excuse to get out of manual labor. WAHOO! Yes, I'm looking at the world through rose-colored bifocals now, my friend. My lovely mother-in-law, who we flew in to help with the party and to watch the kids when Troy and I left on a getaway to Denver, made this cake for me. It has cutouts of me as a kid with a superhero cape playing with plastic dinosaurs...my childhood playmates. Yeah...I love her! Here's a sample of the fun Super Hero photos that were taken. Surprisingly, more people didn't participate in this....hmmmmmm. I probably shouldn't have picked The Scheiers to publically embarass as they did take Carol Chimonas home for me. How she got there is a completely different blog entry... I think Preston's face clinched the deal on which photo to use. The party ended well, as we had numerous people show up to say "Hi" and we got to chat. The band just started playing whatever they wanted and we danced and danced. What a great evening. What a rush. Me, myself and I are thrilled with the results and SO completely happy that we took on the extra work. Yeah, it seemed kinda sad that I would have to throw my own party, but I've always been the one that if I wanted to get it done I just did it myself. I'd like to thank my family who helped set up and take down. I'd like to thank Marilyn Crandall for helping set up the food and keeping it going. I'd like to thank Ashley and his bandmates for the great show. And most of all THANKS EVERYONE FOR COMING TO PLAY WITH ME!